Father’s charging documents did not include details of the family separation, hiding it from the court and from the public. Family and advocates demand her immediate release and demand answers to why the government continues to separate families. PHOENIX — The Trump administration is still separating families who are stopped and detained while crossing the border and, at least in the case of one 15-month old baby, not disclosing the family separation in the charging documents, effectively keeping the information hidden from the federal court and the public. 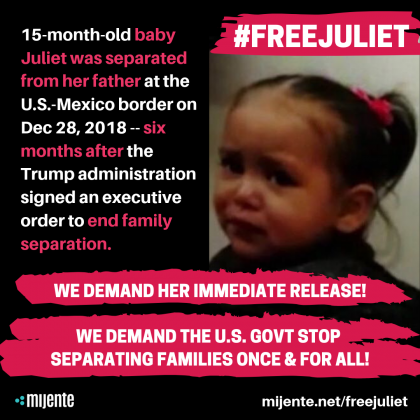 Juliet was separated from her dad on December 28th and has been in detention ever since. The Office of Refugee Resettlement (ORR) charged with processing immigrant and refugee minors refuses to release her from an undisclosed shelter in San Antonio, Texas. Juliet crossed at the Calexico border with her father. They were separated when he was arrested and charged with returning to the U.S. after being deported, although charges were later dropped. He is currently in detention in asylum proceedings. The government failed to document the baby in her father’s charging document; the federal court had no information that the man before him had been arrested with his baby. When the court did find out about the baby, they dropped the charges. 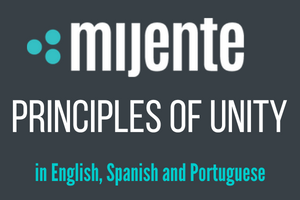 Juliet’s mom crossed the border separately and was released on January 2nd. She is in California with her two other children and is forced to wear an ankle monitor. She is asking ORR to release her daughter immediately. The office has refused until Juliet’s mother provides a credit card to pay for two plane tickets for an agent and the baby to fly to California. Juliet’s mom does not have a credit card. Yesterday, she was told a debit card would suffice, which she also doesn’t have. Baby Juliet was separated from her father six months after the Trump administration signed an executive order to end the family separation policy and a federal judge ordered for children to be reunited. The total number of children separated from a parent or guardian is unknown, according to a January 2019 report from the U.S. Office of the Attorney General. Baby Juliet is now among the countless children who have been separated from their families for no other reason than the current administration’s extremist agenda to criminalize and punish migrants, refugees, and asylum seekers. We demand her immediate release and answers to why the government continues to separate families and to actively hide the separation of these families from the federal courts and from the public.